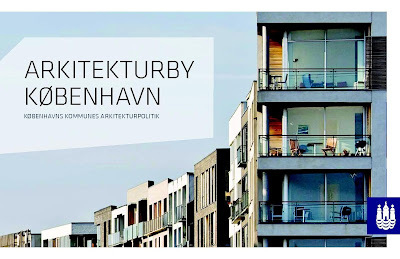 arkitekt vandringer: Politics and architecture...? Speakers Bo Asmus Kjeldgaard, Teknik- og Miljøforvaltning borgmester, Ulrik Winge from Center for Bydesign, Ulla Tofte from Golden Days, Martin Keiding, chief redactor at Arkitektur DK, Simon Harboe from Hovedstadens forskønnelse and Rasmus Rune from 2+1 idébureau. In December 2009 was published the new architecture politic for the city of Copenhagen. It is the result of a long research and work process but still the politicians and people in charge from the Technical and Environmental Group are eager to hear what people have to say about it and what could be pointed out as aspect to work on for the future. Bo Asmus Kjeldgaard and Ulrik Winge started by presenting the general aspects of the architecture politic. In the General Plan from 1954 was stated that the development of Copenhagen was coming to its end: no more will, no more could, no more should be done or built. This has proved to be a mistake. In 2001, the first architecture politic was a reaction to a city in need of attracting citizens and inhabitants in order to develop itself. Now the city is under such a development that it is necessary to evaluate the needs and lifestyle of those inhabitants in order to keep the good and work on the bad spaces. Another point is that Copenhagen aims to become a CO2 neutral city, the first CO2 neutral capital in the world, by 2025. Ambitious plan! But to achieve sustainability in such a way and time needs a support and guidelines which should be provided by this architectrue politic. But Bo Asmus estimates that Copenhagen wouldn't find to much of an issue in the sustainable part. On the contrary the health and care are subjects for complaining. Therefore the architecture politic is reflecting a lot on the city's rooms, supporting thereby the city for the people living in it and working on the human scale. This point is somehow related to Jan Gehl's work and Bo Asmus uses the architect's latest publication (By for mennesker - City for people) in order to define this aspect: 1. sustainable behaviour, 2. accessibility, 3. safety and 4. mixity and diversity. Finally Bo Asmus expresses the desire to talk about more than city and architecture, but also about qualities. Those are the conditions sine qua non for good urban life. the IDENTITY or speciality of Copenhagen : what is special about the city? What is to be kept or to be developped? the ARCHITECTURE of Copenhagen : in order to become the world's environmental metropole in 2025, the architecture of the city should enhance environmental-friendly using behaviour, diversity and identification of the people to their city and city part and it should work on every scale and level. the URBAN SPACE in Copenhagen : by setting focus on the city life, then the spaces and finally the buildings (and not the other way around) the city should be more behaviour inviting -not forcing- and a new expectation set on the clever examination of borders -from public to private for instance. the PROCESSES : it is important to know how to get to the results and to inlighten the projects and demands from every side and with help of every concerned discipline. The four following speakers were invited in order to boost and spice up the debat. Ulla Tofte underlined that Copenhagen was made first of all of Københavner, the inhabitants : they are the core of the city and should be given more opportunities and tools in order to get involved into the city's shaping. If the city should be for its people then it should be made by the people, just as history shows it in great projects such as Brumleby, Kartoffelrækkerne, Christiania or other projects brought onto the municipality by the citizens! Martin Keiding expressed his perception of Copenhagen's identity being the light vs the tranquil darkness -or tusmørke- and the background architecture. This last part is represented by the typical carré typology of red bricks and big windows or by old warehouse or factory buildings, being a heritage to accept and integrate in the contemporary city. Simon Harboe was worried about an architecture politic planned for a recreative city, a city for young students, sports and outdoor people, creative freaks and mothers on "maternity vacation", drinking café latte and sitting on benches in the parks. Where is the everyday man, the businessman, the hard working citizen, the tired person doing the grossary before getting home, the traffic jam, the road work and so? And also, are we going to do any statement or correction on Ørestad? Rasmus Rune was worried about an architecture politic where the word multidisciplinarity doesn't appear in the process thinking, even though the plan shows to be quite multidisciplinary. He insists on the fact that good architecture needs more than good architects today. The city space is so complexe nowadays that other disciplines have to be integrated in the thinking and conceiving processes, as well as the citizens. In order to allow innovation, the citizens need to be concerned with the project from the very beginning of it. That need a clearer paragraph in the architecture politic. Afterwards, the debat took place between speakers and the public. Several questions were brought on about Ørestad. Is it a flop or not? Where are the faults? What can we learn from them? Another point was the difference between plan and reality when it comes to life, diversity and economical accessibility in a new city part. Even if visions and objectives can be established, how is the municipality or the politicians to control it? There is an economic reality of standing and market that results in a waterfront occupied by the most well-off citizens. The same situation happens in many renovated city parts: the gentrification spreads. Nothing can be done unless enhancing the opportunity for commercial activities and social diversity -by heights and sizes legislated by local plans. Questions about connections were arised also. What about biking bridges and connexions obstructing the houseboat traffic and security ? What about connections of the new city parts such as Sluseholmen -which still is waiting for a bridge to link it effectively to the city center? What about social network in terms of schools and institutions for disabled or others, that would support diversity in a neighbourhood and traffic exchanges between neighbourhoods? And the funny questions: how much responsability should be given to citizens -Københavnerne- who are known to be complaining about anything? Wouldn't it slow down some processes -even though their veto has saved the city from some questionable projects, such as the high houses at Krøyers Plads or the Foster skyskraper close by Tivoli?